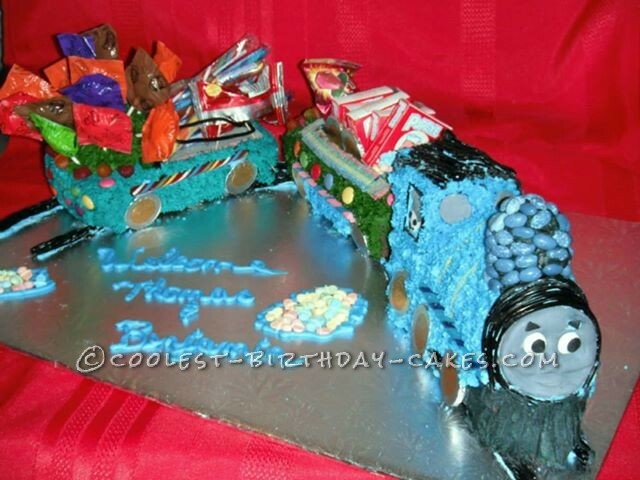 I made this Thomas the Train baby shower cake for two baby boys both with big brothers. There was going to be a lot of young children attending this baby shower so I decided to make Thomas with two cars carrying candies. I followed a video on the net which showed how to make a fondant Thomas the Train face. The instructions were wonderful and easy to follow. I used chocolate Loonies for the wheels and good old fashion candy sticks for the rods for the wheels. The cars carried multiple types of candies, including ring pops, Popeye candy sticks and suckers. 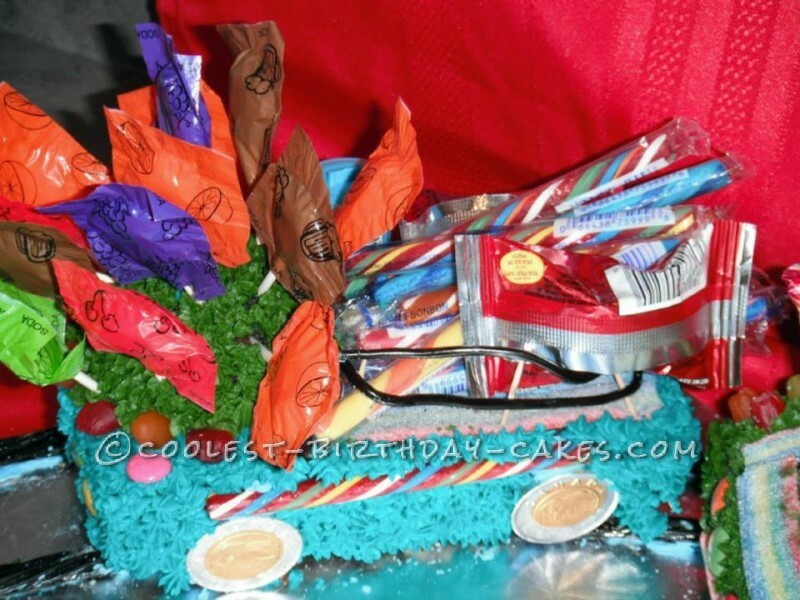 Sour candy strips were used for decorating the storage areas of the cars. The rails were made of black liquorish. Jelly beans and strings of black liquorish embellished the decor as well. The cake was a rich chocolate and was actually eaten along with the candy. Various bright colors garnished the second and third cars and of course, Thomas was blue. This cake took hours to decorate but the children loved it and it was worth every bit of the time. Thanks to all the folks who post pictures and “how too’s” on the various sites. You all helped me with may eclectic ideas for my Thomas. Thomas the Train, engine and two cars carrying a load of candies –something for everyone. The siblings of the babes, along with their friends, loved this train and were able to participate in the celebration. A cake form by Wilton was used for Thomas and the face was made of fondant. I used a video on the net for instructions for this and it worked well. The first car contains old fashion Popeye Candy sticks, Toonies, and Ring Pops. The car is decorated with sour sticks, gummies and Smarties. A loaf cake pan was used and hollowed out for the cars. 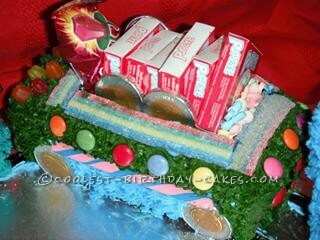 The final car carries lollipops, old fashioned candy sticks, Ring Pops and various candies under the load. String liquorish completes the railings. The wheels are made from the Canadian Chocolate “Loonies” and were a favorite of the children.